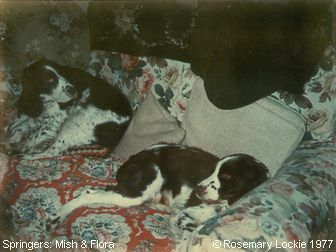 This is a reproduction of a polaroid photograph of Wishful Thinking (in the foreground) with my mother's dog Flora, relaxing in the background, in her rightful place on my mum's settee. Note however, Flora's expression of watchful suspicion, coupled with a low animal cunning... and in the foreground, Mish's back leg draped casually over the front of the cushion. It would have been taken just after we got Mish, so in late 1976 or early 1977. Flora was quite old by then, whilst on her other photograph she would have been only about 4 or 5. Maybe not so elegant as a Range Rover, but definitely a 4-by-4! 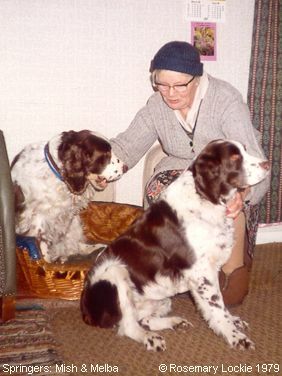 Flora was 10 when she had to be put to sleep - she went blind quite suddenly, and wasn't able to adjust. Shortly afterwards, with a little persuasion from us, my mum got Melba - here's a photograph of the two of them with our Wishful Thinking. Now, stop laughing - my mum's the one in the background, so there! Melba is on the left and WT on the right, and I have to say it, slouching rather unattractively, and looking decidedly porky(!) What ever happened to the Show Springer Model? Looking at this photograph now, she seems enormous in comparison with Young Poppy. Mind you, the observant amongst you may note that Melba is even larger than WT, and that's true, she was. My mum said she reminded her of a carthorse!